So if you even comprehend my headline's CSNY reference this month, I am betting you, like me, are a Baby Boomer! And that's a good thing, as far as I am concerned! 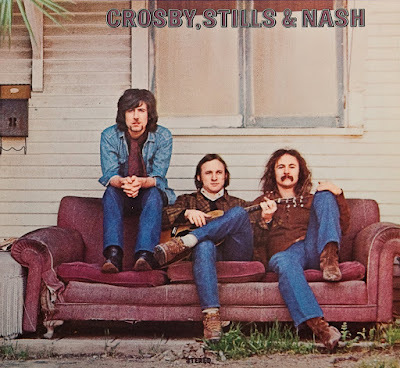 The acronym stands for the full name of surname-based musical group Crosby, Stills, Nash and Young, one of the signature bands from the late 60s and early 70s, which began as (and still sometimes returning to) simply Crosby, Stills and Nash, or CSN, sans Neil Young. Following my attendance at a very enjoyable concert by band founder Graham Nash earlier this month, I ended up making a significant printing connection, in the historical sense, and will share a little of what I came across in doing my follow-up research. In marketing or related societal analysis, an understanding of the defining characteristics of these three major adult age cohorts (Baby Boomers, Generation X, and Millennials) is critical. It does not take great insight to see that, for example, lots of advertising - if you look in the right places, anyway - is oriented towards the Boomers and our current interests in topics like retirement planning and healthcare. And (see below) while it's easy to toss around these labels, it never hurts to make certain we are clear on definitions. And just a reminder that it's never quite clear – note the overlap in birth years between Gen X and Gen Y, which helps keep us mindful that these definitions a bit fluid. And two further notes on the source – since 2010, the "Generation Y" moniker has been largely supplanted by the synonymous term "Millennials", and alas, that 40% of the population comprised of Baby Boomers has probably slipped a point or two, though our spending power remains huge. Individuals born between 1946 and 1964 (approximately 40% of the adult population). Born between 1965 and 1979, this is a post baby-boomer segment (also referred to as Xers or busters). The approximately 71 million Americans who were born between the years 1977 and 1994 (i.e., the children of baby boomers). Members of Generation Y (also known as "echo boomers" and the "millennium generation") can be divided into three subsegments: Gen Y adults (age 19–28), Gen Y teens (age 13–18), and Gen Y kids, or "tweens." Most of the world's first look at CSN - later to become CSNY - came via this album cover. Besides relatively fat wallets, Boomers also have our memories and love for the days of our past and the music that went with it. So when GroupOn emailed with the chance to attend the aforementioned local summer concert by Graham Nash, especially including their little tease (see below), hundreds of local Boomers, including my wife and I, jumped at the chance. Nash's voice and songs are signature elements of the late 60s, 70s and onward, and it was a wonderful show. In the days following (in addition to having "Marrakesh Express" and others tunes stuck in my head), my interest was triggered to learn more about this piece of digital printing history and the role played by Graham Nash in its development. Lodged in the back of my mind that Graham Nash was a photographer as a well as a musician. While there are many famous images involving the band (including the one above from their debut, pre-Young, album), including a few I remembered with Nash and a camera. And then in 2006, shortly after launching my second career, post-HP, as a blogger/analyst, I had a "brush with greatness" as I bumped into, literally, none other than Graham Nash, at the Spring conference of the Photo Marketing Association (PMA) in Orlando. It was one of my first events with press credentials, all very exciting, and it was a "press preview" event in a day-ahead-of-the-main-show which offered the opportunity for press to mingle with vendors and their representatives. It was all quite heady stuff, and bumping into the instantly recognizable Nash made it all the more so! Fast forward to 2015 and post-concert, I started to do some digging on what the story was on the printing side of things, going by that little tidbit offered by GroupOn. In addition to an interesting and fun 10-year old story (see "Nash Editions: Fine Art Printing on the Digital Frontier") that describes the "unmet user needs" (again in homage to my marketing teaching) that Graham Nash experienced when trying to convert his digitally photographed portraits to large format hard copy for a gallery exhibition, and how his colleagues worked with him to get an industry solution that has been evolving ever since. I was fortunate enough to make contact with two of the co-founders of Nash Editions, who are still there after over 20 years. Their stories deserve so much more than being tagged onto the end of this "discovery" part of my story, so stay tuned for August 2015 Observations for some of the Nash Editions saga. Classic Hollies tunes: "On a Carousel," "Bus Stop," and "Carrie Anne"
Classic solo tunes: "Military Madness," "Chicago"
Everyone needs a hobby: Nash's work as a photographer led to the founding of Nash Editions, which was recognized by the Smithsonian for helping to invent digital fine-art printing. I finally did it - used my Apple Watch to complete a transaction. 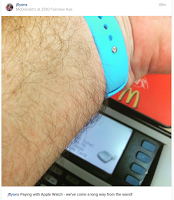 My choice for making my initial Apple Pay payment was McDonald's, at the same location, in fact, where I frequently used the keychain "wand", a trial program going back over ten years, which allowed wireless payments. I joked on my Instagram post celebrating the event (see right) that we've come a long, long, way, a la Virginia Slims, but actually one could argue we're simply right back where we started!